Today we flightplanned Austin-->Llano-->Junction-->Austin. Of course we stopped in Llano and took the airport courtesy car to Cooper's BBQ in downtown Llano. 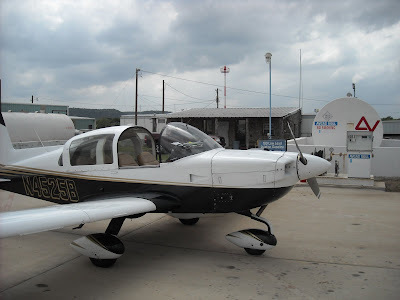 We filed the IFR flight plan for all three legs before departing Austin. Picked up the 1st leg IFR clearance on the ground in Austin by calling Bergstrom Clearance Delivery on 125.5. 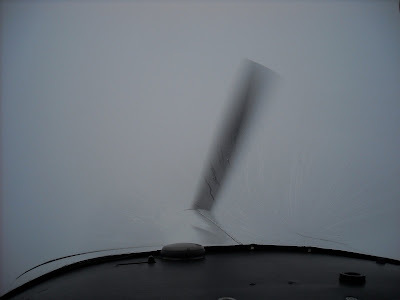 On the second leg we picked up our IFR clearance via cell phone just before engine startup. There are no remote communication outlets in Llano hence the need to make a cell phone call. 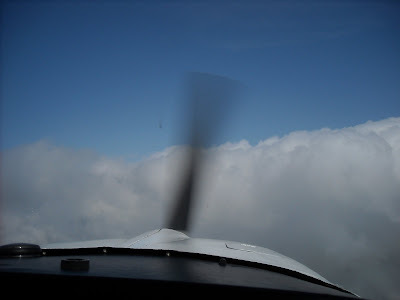 On the third leg (leaving Junction) we picked up our IFR clearance in the air by calling Houston Center on the radio. We were in and out of the soup...sometimes I could see the ground and then we'd go back into the clouds. Below is a map of our flight plan. I hand-flew the route back to Austin. No auto-pilot. Just following the course indicator. Below is the radar track of my flight. As I approached Austin I was receiving vectors to the final approach into Bergstrom ILS-17L runway. On top is pretty mellow. Compare the above photo with this photo in the full soup (below). You can hardly see the propeller! Your vestibular system goes haywire and you fly the instruments and ignore your inner ear sensations. You can also see the moisture streaming up the windshield. I guarantee that no matter how good your inner ear is this sight picture and the motion of the airplane will totally fool you as to which way is UP. On the ground in Junction, Texas. It starts to look like WEST TEXAS out here. The airport is about 1/2 mile north of Intersate-10. Cute little podunky airport with a nice landing strip and velvet smooth taxiway. So all in all it was a good day. 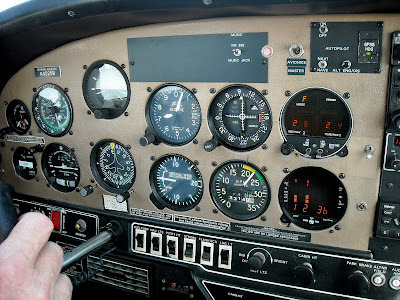 More cross-country time is needed for my instrument rating. The good news is that I can count beautiful blue sky flight days as cross-country time. So I flew all the way to Houston and saw nothing out the window until I was over the Pine Forest golf course on the final approach to runway 15 at West Houston airport. No sightseeing today. Landed, got some ice water, re-fueled, organized my departure/arrival procedures, called Clearance Delivery for routing and clearance, took off and started back to Austin. The flight back to Austin at 6000 feet was smooth. But I must admit the last 10 miles at 2000 feet was *hot*. ATC cleared me "direct" on the return leg...as shown below. 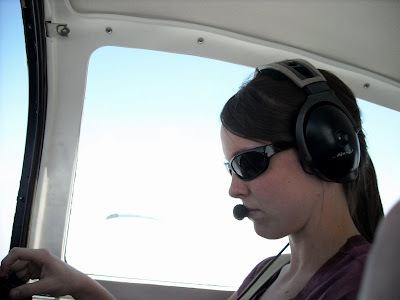 One more IFR cross-country and I'll be done with this phase of my instrument training!